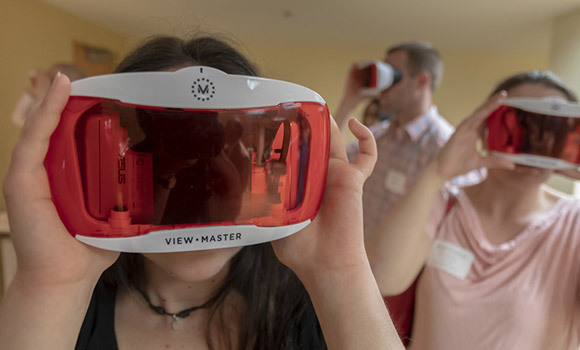 Researchers from universities and hospitals around North Carolina visited UNCG to experiment with VR technology. UNC Greensboro has been awarded a $22,500 Inter-Institutional Planning Grant (IPG) by the UNC System to study the use of virtual reality (VR) technology to solve major human health challenges. Directing the grant work are Dr. Christopher Rhea, lead principal investigator (PI) in the Department of Kinesiology at UNCG, and Dr. Jason Franz (co-PI) in the Joint Department of Biomedical Engineering at UNC Chapel Hill and NC State. Together they are bringing the collective expertise of researchers, clinicians and educators from UNCG, UNC-CH, NCSU, ECU, Winston-Salem State, N.C. A&T State, UNC Wilmington, Elon University, High Point University, Guilford College, Cone Health System and UNC Hospital/Rex Healthcare. This funding allows UNC Greensboro to host a series of meetings to bring people together from a wide range of human health disciplines to discuss how VR could be used to enhance their research and clinical interests. But how do we accelerate the production of this knowledge and the movement of that knowledge from the lab to real life? The first step is expanding and diversifying the number of researchers, clinicians and educators using VR technology, by creating interdisciplinary teams. Earlier this spring, UNCG hosted the first face-to-face group meeting for scholars with common interests to form teams with specific research questions. At the next meeting, those teams will present their proposed projects to the group at large, and work on identifying funding mechanisms for their projects. With researchers from universities and hospitals from around the state coming together to collectively take giant steps forward, the outlook is promising for positive outcomes for the good of the state, the nation and beyond.